Published Apr 27, 2018 by Addison-Wesley Professional. Part of the LiveLessons series. In Core Java 11 Advanced Complete Video Course, Second Edition, Cay S. Horstmann takes that same approach to introducing experienced programmers to Java, with detailed demonstrations and coverage of new features like the standardized HTTP client API that supports both HTTP/1.1 and HTTP/2, and useful new methods introduced in Java 11 like String strip(). This training pairs with the eleventh edition of Core Java, Volume II—Advanced Features, which has been fully updated to cover Java SE 11. 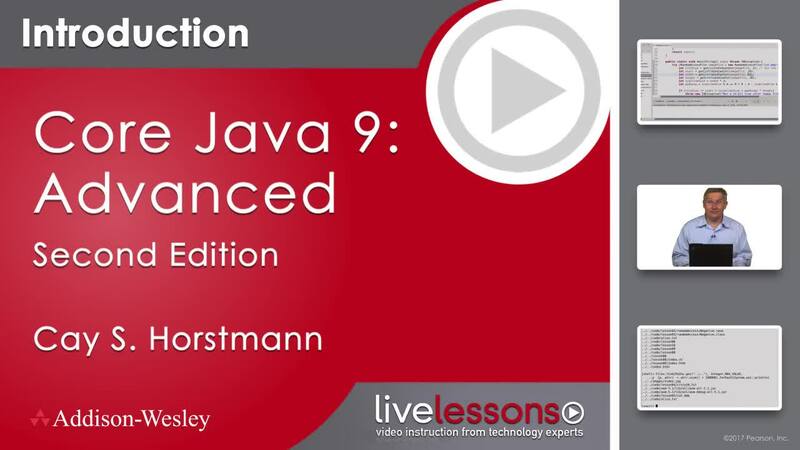 In this video course, you will learn about advanced Java language features along with the most useful parts of the standard library. Lesson 4 covers concurrency, the most important lesson within this training. Nowadays, processors have multiple cores and we need to keep them busy. But it is challenging to write programs that safely run tasks in parallel. This lesson gives you a set of strategies to meet that challenge. The next three lessons are all about building tools. Lesson 5 introduces the annotation mechanism. You will see how tools use annotations for checking program correctness, generating code, interfacing with databases and web services. Another way of making your programs smarter is by allowing your users to provide extensions in Java or a scripting language. In Lesson 6, you will learn how to declare and use Java platform modules, and how to migrate your applications to work with the modularized Java platform and third-party modules. Lesson 7 shows you how to run the Java compiler or a language interpreter in your programs. In Lesson 8, you will learn how to write programs for users anywhere in the world, with their preferences for formatting and messages in their language. Lesson 9 covers the new java.time package that handles complexities like leap years, time zones, and daylight savings time. The last two lessons, Lessons 10 and 11, show you how to interface with relational databases and how to read and write XML data. These are essential skills for programming server-side application.